Featured Easy to post, not as easy to live! Discussion in 'Christian Spirituality Forum' started by "ByGrace", Apr 11, 2019. Tzephanyahu, Nancy, Dave L and 2 others like this. Well, I am getting better. I think I am getting worse !!! Good to refer to a verse of Scripture, and if ppl still want to argue, then leave it at that. 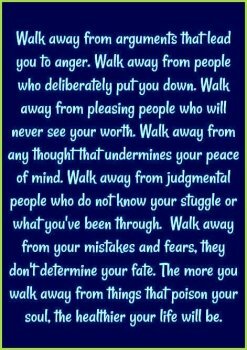 I am better than I use to be with some of the things on the list -not sure I agree that it's always right to ' walk away ' - Jesus didn't - he confronted people at times, the difference perhaps was that he prayed and knew what was the right thing to do, and say. You cannot avoid negative people all the time, it's how you communicate and what you allow to get through as opposed to letting it go over your head. It's also ' holding every thought captive to the Lord ' - allowing him to be a filter, so that we move forward with his wisdom. The above is not always easy to do - I think it's a strategy that we forget! amadeus, "ByGrace" and bbyrd009 like this. All good advice. As they say "Just do it". There is the ignore button. I usually have a half-dozen people on this function at any one time. I check back with their postings from time to time to see if anything has changed. Recently a poster started a thread on being sorry. That's a good sign. The people to ignore in my books takes 2 forms. Those that are just ungracious and wrong. And those who bend the truth till it hurts. The truth is a very difficult thing. Jesus came to bring division...a scandal. It's normal to have difficulty with the truth. it's the people who think the truth is so easy that anybody should get it...these are the offenders of truth. If somebody says to me...that's hard to accept what you just said.....I say amen! The way is narrow indeed. Smack the other cheek! wait turn the other cheek be yourself and hope for the best. That flesh battle will be ever present, sometimes we handle it like a champ, other times the making of a son is in full bloom. "ByGrace", bbyrd009 and Butterfly like this. There is the ignore button. I usually have a half-dozen people on this function at any one time. I check back with their postings from time to time to see if anything has changed. Plus when the ignored person is quoted, you see what they say anyway. That was my only try at it...I know I wont ever be a fan of 'the ignore' button. Nancy and FHII like this. Why not, just walk in love, and not pay attention to what is on that list. And later down the road, just look back, and you will find that you overcame every thing on that list. Not all things are overcome by walking away, but by walking in love(Him) For in Him are all things possible. Oh true indeed...but I find the knowledge that we are commanded to walk in love, and the actually doing of it 24/7 is also "Easy to say but not quite so easy to live". Maybe you live a stress free life and never have dealing with the public.. It is not "easy" it is a constant overcoming in the Lord, and will be until the end of the road. 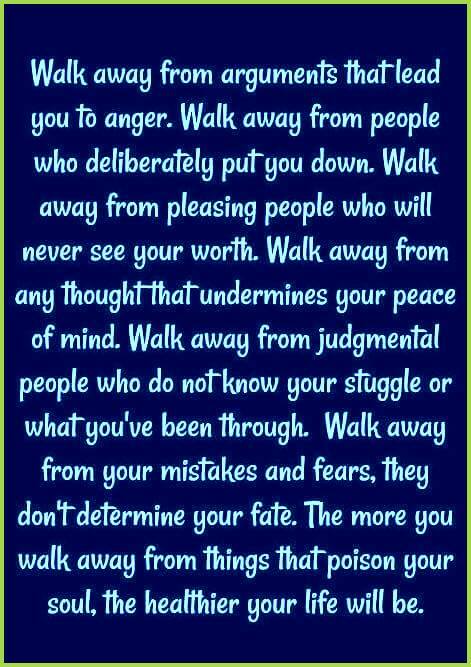 I walk away from everything my conscience will allow. I'm a first class introvert and hermit. My husband is too...but how are you alone in the car when people don't move at a green light but are texting? He says "In the car is where I lose my sanctification"
We all have buttons but the greatest blessing is when they don't work when pushed. I do work in the public in very stressful situations. I depend fully on Him to get me through it. And He does. When breaks are taken He restores me for He is faithful. With me, it is harder than most, because of the gift of discernment. To pray unceasingly, does not necessarily mean on your knees, it can be done all through the day. A constant communication is also key. The intent of my post is to show that it is possible just like I knew it was possible that you can start op's that do not fizzle out. And yes I am unique. I always practice what I post. But God has given me grace to be humble about this, because I don't think I'm half as good as I really am! It takes a lot of humility to admit that they are much better than they think they are. But this is what I really think: everywhere I go, I go, too--and that spoils everything! Seriously, this brings me to the early church's understanding of the gift of prophecy. It is neither prediction nor just inspired forthtelling, but the Spirit's exercise of jurisdiction of the conditions of divine forgiveness and redemptive security. That was the subject of my Harvard doctoral dissertation in NT. In simpler language, prophecy in essense addresses the question: Is my outward conduct and self-image truly a reflection of my inner spiritual condition? Who am I really when no one is looking? So trur humility is at the core of true spirituality as measured by that prophetic charism--and self-delusion is our greatest spiritual danger.